NEWS: We have reduced the price of Photo Booth by 30%. NEWS: We strive to give you a better service and as a result changes have been made to give you more choice without you paying more, to reflect this we have made the information more accusable and easier to understand. This also mean you can purchase your wedding photography separately from your Wedding album and prints far easier. We hope you like the changes. All our services are carefully coasted to ensure my client are getting the best service for the best price. I believe my client deserve the widest possible choice in the selection of their wedding photography services and my services should suite my client tastes and budget. You have the now opportunity to mix and match the services you require. If you have any queries please contact me on 01623 401439 or 07714087229, you can also email me: richard@richardstevens.org.uk. My Wedding Moments has offered professional wedding photography services since January 2003. We serving Nottinghamshire, Derbyshire, South Yorkshire, Northern Leicestershire and West Lincolnshire. The Wedding Photographer's site by Richard Stevens Photography. 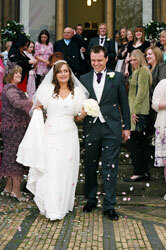 We are Wedding Photographers in Mansfield, Nottinghamshire, serving the East Midlands. Richard Stevens the photographer created this web site to better serve his customers. The site contains customer online wedding albums enabling the family and friends of the bride and groom to view the days events. Click on the "Client Gallery". New and potential customers can view wedding images, Richard has provided samples of his work. Just click on the "Sample Wedding Gallery". We have included full information about our wedding prices and services. Click on the "Photography Services". Richard was born in Sussex in 1960, the son of creative parents he was encouraged to develop his artistic and design skills. In 1976 he studied art and design at the Plymouth College of Art & Design. He then went on to study Photography in West London in 1978 and in 1979 he joined the BBC at Television Centre as an assistant photographic technician. He continued his photographic studies until 1983 and continued to work for the BBC until 1987. Since leaving the BBC he has worked as a freelance photographer and illustrator also as a publisher and designer. On the 16th of December 2002 Richard Stevens became a sole trader and started the new business of Richard Stevens Photography. The goal of the new business was and still is to offer photographic services at an affordable price and to give customers almost unheard of access to their images. The business has taken on two part time assistants. We have a very wide range of customers including universities and colleges, property developers and property management companies, sculptors, painters and potters. Oh yes, and not to forget you. Richard Stevens Photography provides customers with their own copies of their wedding pictures so they can independently reproduce as many as you please. Professional Quality printing is available at 17 Middlegate, Newark, NG24 1AG. Telephone David on 01636 688577. The booking fee and deposit is only £80 and nothing to pay until the wedding day. The booking fee and deposit is subtracted from the total on completion of the work and non refundable on cancellation by you. A cheque made out to Richard Stevens for £80 or cash is preferred.